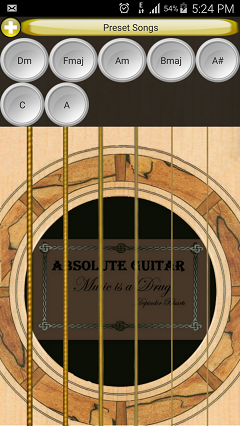 Absolute guitar is a virtual guitar simulator and a pocket guide containing all the information you need to know to jump start learning a guitar. It contains theory lessons to understand the basic fundamentals of a guitar and the chord diagrams to learn from basic to complex chords. 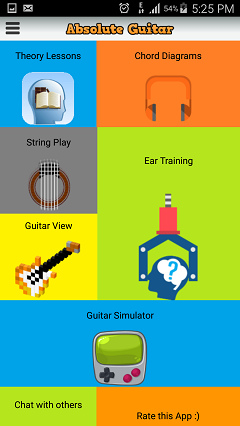 Not only this this application helps you to train your brain with the guitar sounds with proper music letters.The sounds used in this application are actually recorded using a real acoustic guitar and unlike other applications it is not generated by program. After learning different sounds and their letters you can even test your skills by the inbuilt ear training game. This application can teach you basic of guitar even without having a real guitar in hand although having a guitar is highly recommended to learn the different finger shapes for different chords. 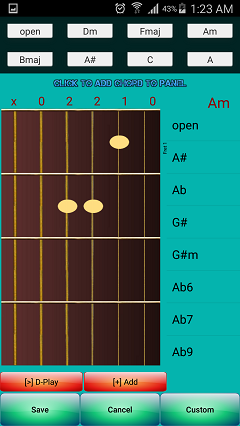 The guitar simulator in the application helps you to play different chords virtually on your mobile.